Christians visit Jerusalem this time of year to connect with places associated with the Easter story. One such place enshrines a rock claimed to be where Jesus prayed before his death. According to the Gospels of Matthew and Mark, after the Last Supper Jesus went to a place called Gethsemane on the Mount of Olives, praying that his life be spared if that was God’s will. Without naming the place, the Gospel of Luke says Jesus was in agony while praying before his arrest. Saying nothing about praying, the Gospel of John says Jesus was arrested in a garden. Combining these accounts, Christians believe Jesus prayed in agony in the Garden of Gethsemane. No account mentions a rock. Christians have identified various locations on the Mount of Olives as Gethsemane. 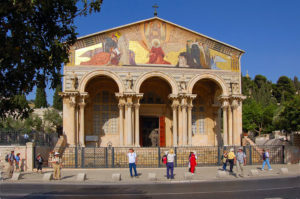 In the twelfth century, Crusaders built a chapel near the foot of the Mount of Olives next to a grove of olive trees they associated with Gethsemane. Some Christians later became convinced that the olive trees existed during the time of Jesus and that Jesus had knelt to pray on an outcropping of bedrock near the abandoned Crusader chapel. In the 1920s, Franciscans built the neoclassical Basilica of the Agony around the flat rock, which extends above the floor in front of the high altar. The church’s interior is intentionally dark to reflect Jesus’ agony. Twelve small domes are painted blue on their undersides to evoke the night sky under which Jesus prayed. The exterior includes four groups of columns, each topped by the statue of a Gospel writer displaying a verse leading to beliefs about Gethsemane. A colorful mosaic on the façade above the columns depicts Jesus mediating between God and humanity. Because donations to build the church came from many countries, it is commonly known as the Church of All Nations.